All transactions are safe and secure with a reliable history in online purchasing behind each of our associates. 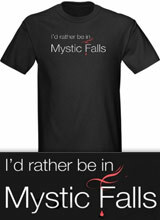 Buy the I'd Rather Be in Mystic Falls t-shirt to own Vampire Diaries clothing and merchandise. This Mystic Falls t-shirt design reads, "I'd rather be in Mystic Falls." The falls are symbolic like the crow is in the books or on the TV show. In the books, Damon can transform into the crow because of his vampire powers. However, on the show the crow is simply Damon's pet that he can control through his thoughts. This Vampire Diaries shirt is available in many styles and colors for men and women, so pick one for yourself and your friend. Check out the new Vampire Diaries books by L. J. Smith available below as well. You won't regret it! In addition to the I'd Rather Be in Mystic Falls tee above, browse the Vampire Diaries Clothing Gallery for more apparel like men's and women's clothes, kids shirts or hoodies.